This week Canon announced its new 40mm f2.8 pancake lens. The MTF charts look great. Much better than my 24-70mm f2.8L and much better than the 50mm f1.4 or the f1.8 and it’s only $200 bucks. It’s one of the first of Canon’s new lenses to feature STM (Stepping Motor) for constant focus when recording video supported by the new T4i. Now if you’re thinking, “What’s the big deal?” Check out the MTF charts for canons “magical” f35mmF1.4L in comparison. Based on these charts, this 40mm should optically be amazing. Unfortunately we’ll have to wait until it ships to really find out. They also announced this lens along with an 18mm-135mm that will play the roll as the kit lens for the T4i. This lens also equipped with STM. 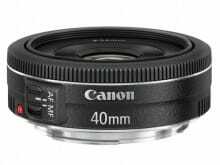 The purpose of this 40mm f2.8 pancake lens was for lightweight and portability while providing pristine optics at an affordable price. If minimum focal distance is only 12” and will make a great compact light easy to use lens. It is possible this lens was designed for future canon mirrorless camera bodies. We’ll have to wait and see. Personally I’ve notice that 80% of all my walk around style photos are taken in the range of 35-45mm on my 24-70mm f2.8L. I get tired of lugging that huge thing around when I just want to go hang out somewhere, so this lens is perfect for that style of shooting. Needless to say I’ve ordered one. The 18-135mm doesn’t really interest me since I already own the 24-70 f2.8L and 70-200f2.8L IS II. But should be fun if used with the T4i because of the STM. I’ll update with photos and tests of the 40mm as soon as it’s available and I receive it. I’ve heard around late June is when it should ship. I am excited for this thing.